Installation methods include radiant barrier draped over the rafters, applied directly to the roof sheathing, stapling to the bottom of the rafters, and even laying radiant barrier on top of the attic floor insulation. Some of these installation methods are preferred over others, but all have sufficient research and testing to demonstrate their performance. The installation method that is right for you may depend on a number of factors like climate, roof pitch, attic height, construction stage, and even the location of your ducts and HVAC equipment. There are certain pros and cons for radiant barrier applied in each of these methods, which we have addressed below. In new construction, the most popular application for radiant barrier in warm climates is to have it draped across the roof rafters, under the decking. This is makes it easy for the roofers to install in a short period of time, assuming the weather is accommodating. 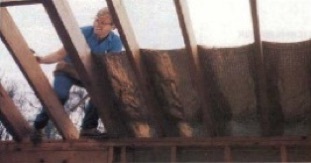 Many builders have radiant barrier applied to the roof sheathing directly to cut back on time spent up on the rafters. •It’s inexpensive and easy to install as a roof is being repaired or replaced. •It decreases the temperature of the A/C equipment and ductwork in the attic. •The reflective side is facing down, where dust, dirt and debris cannot settle. In an existing home, especially in warm climates, the preferred method for installing a radiant barrier is stapled to under the roof rafters. A heavy duty radiant barrier should be used for this application, so that it can hold staples and not come down over time. This method has many of the same advantages of installing radiant barrier under the decking, while minimizing many of the concerns. •Can be applied in an existing residence without the need for replacing the roof. 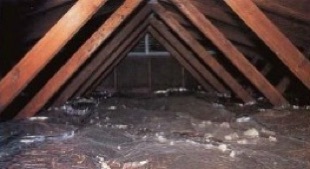 •Covering both the roof rafters and attic walls improves the efficiency. A radiant barrier applied horizontally over the attic floor insulation is the more popular application for existing homes in cool climates. The heat escaping in the winter will be blocked at the insulation level, while heat radiating down in the summer will still be blocked from reaching the living space. For this installation method, a lightweight and perforated radiant barrier may be best. 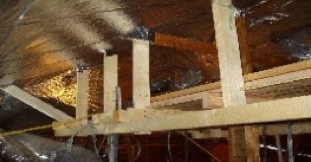 The light weight prevents the radiant barrier from weighing down the insulation, and the frequent perforations allow moisture in the insulation to escape. •Performs in both cold climates and in warm climes with little or no attic ducts. •Easier to reach places like low pitched attics and vaulted ceilings. 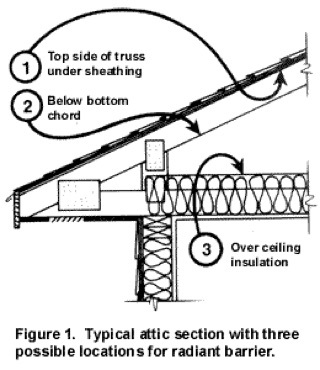 •Attic walls can also be covered to maximize the efficiency of the radiant barrier. •This method is easy to install and no special tools are required.